Here at Heritage Dental Group, we have highly trained and experienced dentists when it comes to the quick, safe and painless removal of wisdom teeth, with fast recovery. Wisdom teeth, found at the back of the mouth, can cause problems for some people and may need to be removed. If your wisdom teeth need to be taken out, you will meet with the dentist carrying out your procedure to discuss your care. Following is an overview of what you can expect, although your treatment may differ from what’s described here as it will be designed to meet your individual needs. Wisdom teeth usually emerge from gums between the ages of 17 and 24. They are the last of the large grinding teeth at the back of your mouth (molars). Some people never develop wisdom teeth, or you could have up to four appearing – one in each corner of your mouth. For most people, wisdom teeth don’t cause any problems and so they don’t need to be removed. However, if there isn’t enough space for them to grow at the back of your mouth they become ‘impacted’ wisdom teeth, causing pain, swelling and/or infection. Having your wisdom teeth removed (extracted) can relieve these symptoms. It may be possible for your dentist to remove your wisdom teeth, or you may be referred to an oral surgeon. Are there any alternatives to removal of wisdom teeth? Antibiotics can help treat an infection, painkillers e.g. paracetamol, rinsing with warm salty water or chlorhexidine can help with pain relief, but your symptoms may flare up again. If a wisdom tooth is partially erupted, removing the gums lying over your tooth (operculectomy) can help in some cases. Having your wisdom teeth removed is often the only way to permanently relieve your symptoms. Infection – impacted tooth started pushing on to the gums which can cause infection. This infection and inflammation can cause pain, jaw stiffness and swelling. Infection can also cause bad breath and unpleasant taste in the mouth. 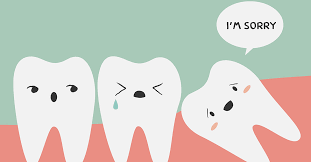 Pain – Pressure and infection from the impacted wisdom tooth may cause pain to the nearby teeth. Crowding – If there is not enough space, wisdom teeth may push nearby teeth out of their position and create crowding. Cysts – If wisdom tooth is not removed on time, it may cause cyst (a sack of fluid) around the tooth. This cyst can destroy the bone and damage gums and other teeth around it. Cyst formation around un-erupted teeth is uncommon. Ulcer – sometimes your upper wisdom teeth can start erupting out against the cheek, which will start rubbing against it and cause ulcers. A food trap – food can become caught in between the wisdom tooth and the molar beside it, when food gets trapped it’s a lot harder to clean being right up the back therefore can easily cause cavities. What happens at the first wisdom teeth consult? On your first wisdom teeth consultation, the dentist will take an OPG X-ray which will allow him to let you know how hard or easy it will be to take your wisdom teeth out. He will also explain any possible risks or complications that may arise in relation to what else is around your wisdom teeth. For wisdom teeth that are close to nerves the dentist will take a more detailed 3D scan of your jaws to better understand any complications that may arise during the removal of the wisdom teeth. You will also be given information sheets on the procedure and any risks or complications that may arise. Your dentist will explain how to prepare for your procedure. The removal of wisdom teeth is usually done under local anaesthesia. This completely blocks pain from your gums and you will stay awake during the procedure. You may be offered a sedative to help you relax during the procedure. If your wisdom teeth appear to be difficult to extract or you choose to have your teeth removed under General anaesthetic, the dentist will refer you to an oral surgeon who will make arrangements for the procedure to be done. Your dentist will discuss with you what will happen before, during and after your procedure, and any pain you might have. This is your opportunity to understand what will happen, and you can help prepare questions to ask about the risks, benefits and any alternatives to the procedure. This will help you to be informed, so you can give your consent for the procedure to go ahead, which you may be asked to do by signing a consent form. X-ray examination – taking an x-ray will help the dentist assess and plan weather it’s a simple or more complex removal. Where to have surgery – depending on the tooth, the dentist will assess and advise you on whether it can be done in the dental surgery, hospital or day surgery hospital. Driving after surgery – it is encouraged to not drive after, rather ask a family or friend in advance. After the surgery – rest is the best thing after surgery, once your dentist is satisfied with the recovery they will send you home. Pain relief after surgery – pain may be minor in some people and greater in others, your dentist will ask if you would like stronger pain relief. Pain will usually start to decrease after the second day, however, some people may still need pain relief after one week. If the pain does not go away or gets worse contact your dentist ASAP. Control of Bleeding – your dentist will provide you with gauze to take home, you can apply pressure over the area by biting on one of those pieces of gauze. The pressure will help stop the bleeding and a blood clot will form. It is important to not to disturb the area or it may start bleeding again. The gums may ooze blood slightly for a day after surgery. Any bleeding should stop by the second day, if not contact your dentist ASAP. Swelling – it may occur after the surgery and can vary from little to severe and most swelling can take four to five days to go down completely. Swelling can be reduced by applying ice packs on the cheeks. Follow up – A follow up visit is important, stitches may need to be taken out and the dentist will want to checkout the healing on the area. We will call you the next day after extraction to check on your progress.